Pesi : Nadia Comaneci "Inspires Me"
Nadia Comaneci was one of the youngest competitor in the the 1980 summer olympics in Moscow and is now known as one of the best gymnasts in the world. Nadia was born November 12 1961.Nadia started gymnastics at the age of 6 and placed 13th in her first Romanian Champions in 1969 at the age of 8. ‘Nadia’s first international success was at the age of 13. In the 1975’s at the European Championships in Skien, Norway, Nadia won gold medals in every gymnast event apart from the second floor exercise where she placed second. In 1976 on July 18th Nadia Comaneci was awarded a perfect 10 on the uneven bars. 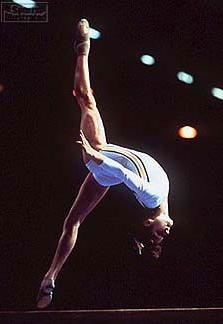 Nadia Comaneci inspires me because she competed in one of the hardest competitions in the world and always strive to succeed.